Zeiss Victory FL binoculars are quite possibly the brightest binoculars on the planet. Made with fluorite ion glass, Zeiss Victory FL binoculars feature the highest percentage transmission of available light. State of the art phase-corrected and full-multi-coatings combine to give the Victory FL binoculars the incredibly sharp images, high contrast and rich, true colors. The LotuTec water shedding coating makes water bead up and rapidly run off the Zeiss FL binoculars to provide clear views even in the rain. 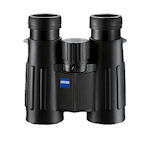 Victory FL binoculars are available in 8x32, 10x32, 8x56 and 10x56 versions. For a state-of-the-art viewing experience, try a Zeiss Victory FL binocular.